This story was updated at 12:08 p.m. EDT. Thehuge mothership jet built to launch suborbital spaceships for Virgin Galacticsuffered a collapsed landing gear Thursday morning when it landed in California's MojaveDesert, according to officials at the Federal Aviation Administration. No injuries have been reported. "Two FAA inspectors were on scene to examine the aircraft," Ian Gregor, a spokesman for the FAA, told SPACE.com. "The left main landing gear was damaged. This appears at this time to be an incident and not an accident." Therunway incident at the Mojave Air and Space Port did not involve VirginGalactic's SpaceShipTwo,the suborbital passenger-carrying spacecraft designed to be carried into launchposition by WhiteKnightTwo. SpaceShipTwo is also built by Scaled Composites. WhiteKnightTwois a specially designed jet-powered mothership, built to haul the SpaceShipTwospacecraft to a release altitude of approximately 50,000 feet (15,240 meters). Theaircraft was on its 37th test flight, and has been flying since December 2008. ScaledComposites was founded by veteran aerospace designer Burt Rutan. 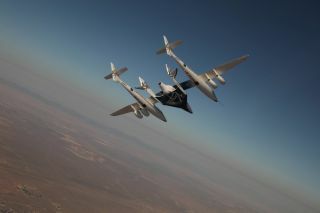 The company isdeveloping the SpaceShipTwo spacecraft and their WhiteKnightTwo motherships forVirgin Galactic. SpaceShipTwois built to carry eight people (six passengers and two pilots) on suborbital flights that would reach outer space for a few minutes, though would not gohigh enough to enter Earth orbit. Theflights will provide a weightless experience and a view of the blackness ofspace and glowing Earth below. Tickets cost $200,000 per person. VirginGalactic was founded by British billionaire Sir Richard Branson. Rutanand Scaled Composites also built SpaceShipTwo's predecessor, the smallersuborbital craft SpaceShipOne, financed by Microsoft co-founder Paul Allen,which won the $10 million Ansari X prize for reusable, manned suborbital spacecraft in 2004.